Today is the 2nd birthday of my great neice & nephew, Jackson & Isabella. 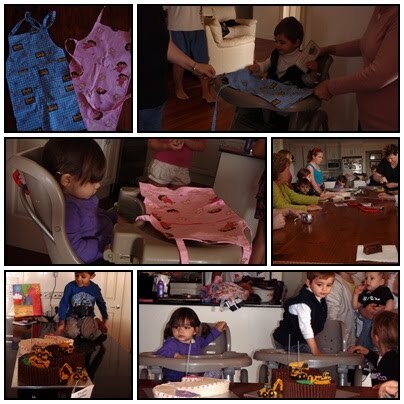 I made them an apron each, a Bob the Builder for J and a Dora the Explorer for I. Their mum and all the other ladies liked them the twins weren't so impressed, but they didn't seem to care for any of their pressies today. I'm off to see My Fair Lady this arvo so I will be back with some piccies hopefully. they'll like the aprons when they actually get to use them in play i'm pretty sure - or dressup! !